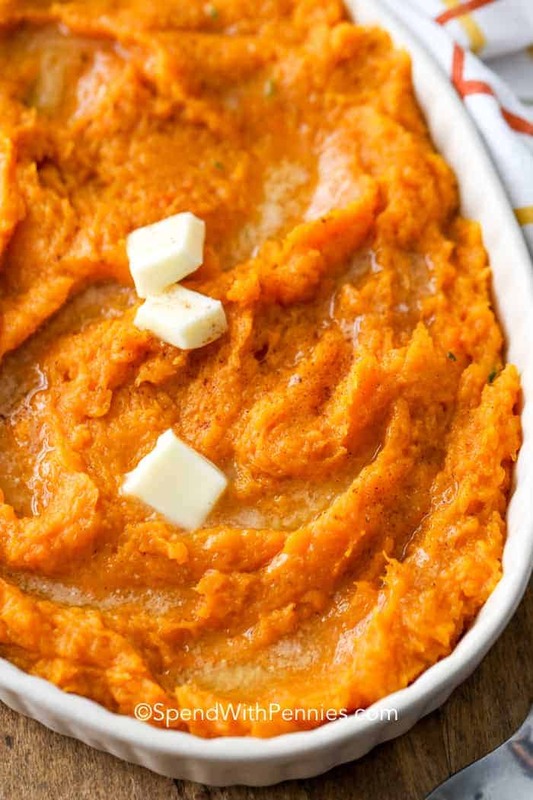 Sweet and savory, Mashed Butternut Squash recipe just might be your family’s new favorite side dish! This is an amazing recipe that only takes a few simple ingredients and is the perfect side dish for Corned Beef or delicious Bacon Wrapped Pork Tenderloin! It’s SO easy to make, it’s no wonder it’s so popular! While butternut squash is a winter squash that grows on a vine, it can be found year-round at the supermarket. So no need to set this savory recipe aside till the colder months, enjoy it this summer! 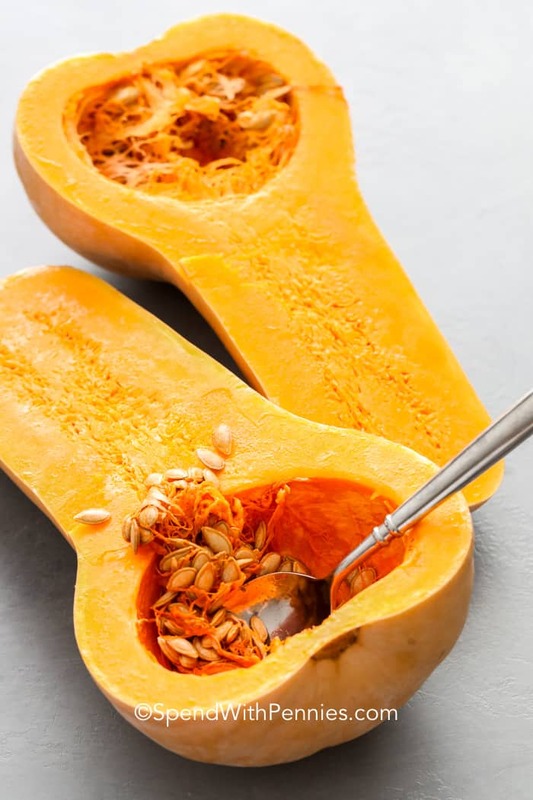 Butternut squash has a sweet, almost nutty flavor, kind of like a regular pumpkin and the seeds can be made the same way as roasted pumpkin seeds or saved to plant in the garden at springtime! Because of its mild flavor, butternut squash is also versatile roasted as a side vegetable, whipped up into a velvety butternut squash soup, or served cold like a salad! 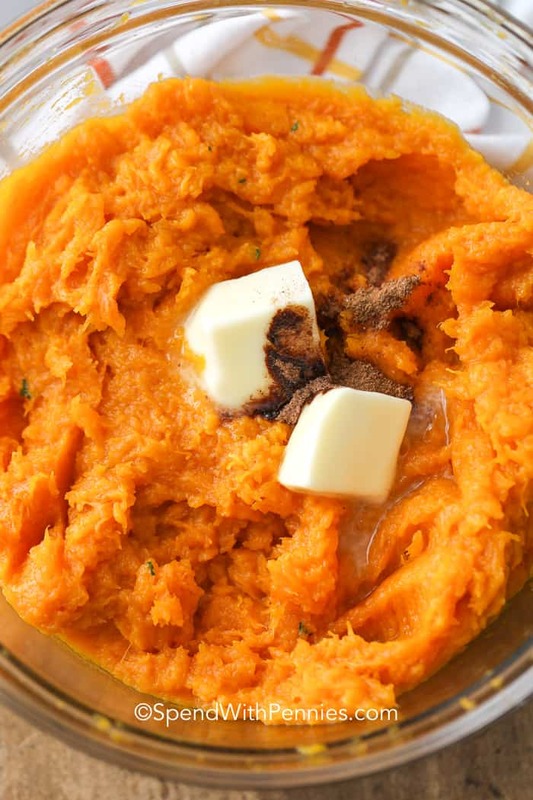 This recipe takes this sweet veggie and turns it into a simple side mash! To Bake or To Steam? Boiling/steaming butternut squash is the quicker method but it doesn’t have quite as much flavor. Baked Butternut Squash doesn’t absorb water and it caramelizes a bit adding another layer of flavor so that’s the method I use in this recipe. If you’re short on time, the squash can be cut into chunks and steamed about 15 minutes. Prep the Squash: Before cutting into the butternut squash, slice a very thin piece off the bottom (the widest part) and set it upright on a towel to keep it sturdy. Then cut it straight down the middle from the top with less worry! Once you have scooped the seeds out brush the inside with a portion of the melted butter and sprinkle with your choice of spices and brown sugar, if using. Bake and Mash: Place butternut squash on a baking sheet, cut sides up, and bake until extra tender. When it’s done cooking and cool enough to handle, scoop out the flesh and place in a large mixing bowl! Mix the butternut squash to your desired consistency, slowly adding the cream and the remaining butter! Mmmm! Before serving, season with salt and pepper. Or sprinkle with brown sugar for a final extra sweet touch! This recipe is also easy to personalize to your taste! Mashed butternut squash with maple syrup will have a smoother texture than mashed butternut squash with brown sugar but both sweet and savory delicious! Did we mention irresistible too?! More Side Dishes Sure to Delight! This mashed butternut squash will be quick to become a family favourite. Serve it in place of your classic mashed potatoes! Cut butternut squash in half lengthwise and scoop out the seeds. Lightly brush the squash with melted butter (reserve the rest for mashing). Sprinkle with spices and brown sugar if using. Place on a baking sheet cut side up and bake 1 hour or until very tender. Scoop out the flesh and place in a large bowl. With a hand masher or an electric mixer on low, mix until smooth. Pour in cream and melted butter to taste. Season with salt & pepper and serve. Previous PostPrevious Delicious Cauliflower Salad with a Crunch!